THE LAST TO KNOWS alla Corte dei Miracoli | Just Visit Siena ! On Friday 6th December (btw Santa Claus Day) I had an opportunity to enjoy a good concert of The last to knows. Everything was planned since 22.30 o’ clock (in fact started a bit later) in Corte dei Miracoli which I introduced you yesterday. Here about this what was there on Friday . . . frankly speaking didn’t think that will have so good fun. 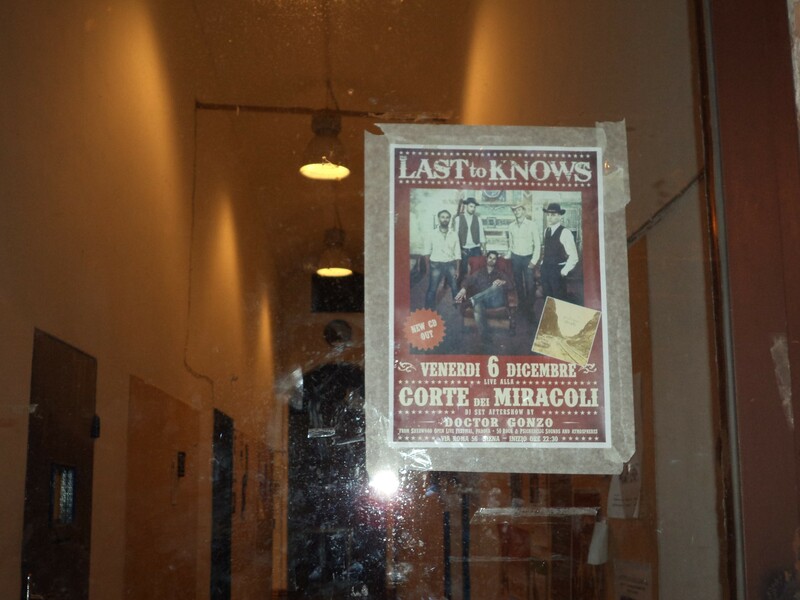 The Last to Knows is a country/folk/blues band from Siena. And they promoted their new CD that was possible to buy during the concert as well as other gadgets. Despite I haven’t listened before this kind of music, I liked it and stayed till the end. What is more I couldn’t sit or stand without dance . . . but not only I! I was seized by the music. It is a pleasure to learn about our local bands and participate in theirs performances. And then it is a pleasure to share with you! An advantage of this that a band The last to knows is from Siena is that we have a lot possibilities to see them! Next chance is so close because on 12th December in bookshop Einaudi – The Last To Knows acoustic live! Impossible to miss this occasion!